In the May/June issue, instead of focussing on the world we want to create, we look at the paths we take to create that world. The struggle for a better future can bring us closer together - a theme taken up by Mothuir Rahman, a member of the political strategy team for Extinction Rebellion. By locking arms with others and risking arrest for the lives of strangers we challenge patterns of selfishness set by neoliberalism. We also look at the structures we live within and whether these are helping or hindering the realisation of our ambitions to create a better world. In an interview with naturalist Chris Packham we discover more about the purpose of his Manifesto for Wildlife - a manifesto that sets out to shake up the conservation movement and encourage change. On this positive note, we invite you to read our featured articles from this issue of Resurgence & Ecologist and hope you find much to enjoy. Activist and Barrister Polly Higgins has been campaigning for 10 years for the crime of Ecocide - the mass destruction of eco-systems, air, water and climate - to be adopted in international law. Oliver Tickell meets this remarkable campaigner and founder of Mission Lifeforce. At this pivotal point in history, Extinction Rebellion has harnessed the power of the collective to create a global movement - a movement that is challenging governments around the world to take immediate action on climate change. Farhana Yamin explains why there can be no more 'business as usual'. The risks of climate change are no longer theoretical. Tony Juniper, Chair of Natural England, explains why protecting the Earth's natural systems does not go far enough, we need to focus on recovery. To move the agenda forward, there must be a clear political mandate and world leaders who will rise to the challenge. GP James Szymankiewicz calls for a Naturally Healthy approach to health care - reconnecting people with the natural world as a way of dealing with health problems emerging from our disconnected society. Interventions could be as simple as walking for health, as active as coasteering, or as involved as volunteering. The results can be astounding. Poet Matt Harvey takes a sideways look at guerrilla gardening and the Incredible Edible movement, a local food initiative that encourages community engagement through growing. Could this be a way to engage disaffected young people excluded from mainstream schooling? Mark Tully reviews Satish Kumar's new book Elegant Simplicity: The Art of Living Well and discovers a book filled with wisdom and insight. Satish advocates simplicity, not just in terms of decluttering our lives of material possessions, he invites us to embrace simplicity on every level of our lives. Angie Lewin is inspired by the clifftops and saltmarshes of the Norfolk coast and the Scottish Highlands: depicting contrasting environments and native flora through wood engravings, linocuts, silkscreen prints, lithograph and collage. These landscapes are often glimpsed through intricately detailed platforms. An exciting new series of Resurgence events in London in association with 42 Acres Shoreditch. The monthly programme, inspired by the ideas of Resurgence covers issues including the environment, arts, meditation and ethical living. Keep up to date with our project to create a Resurgence Centre for Education, Environment and the Arts in Hartland. Includes videos, links to the latest articles and pictures of the Small School chapel and garden. 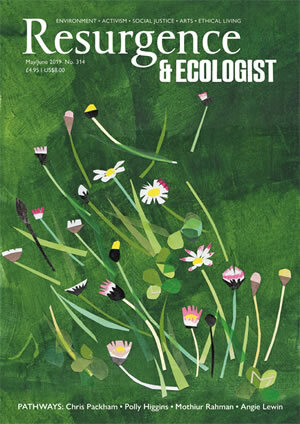 Enjoy a free pdf issue of Resurgence & Ecologist magazine. Within the pages of this unique magazine you'll find thought-provoking articles on the latest environmental, ethical and social issues, plus opinion, ideas and stunning art. To mark 50 years at the forefront of environmental publishing, we've made a short video all about the magazine, now published as Resurgence & Ecologist, and the environmental charity behind it - The Resurgence Trust. Web banner image: Shepherd's Cottage, by Rebecca Vincent; The Path is the Goal: Ripe Corn Before The Storm by Lesley Seeger; Getting the Law in Order: Amongst the Moss © Ben Porter; A Global Rebellion: An Extinction Rebellion Friends of Greta Schools' Alarm Whistling Exercise was launched in some schools in Accra, Ghana, West Afrika on 18 Jan 2019; Hope for a Breakthrough Year: Illustration by Dave Cutler; Just What the Doctor Ordered: Photograph © Ben Lee / WTML; Joining the Veggie Massive: Illustration by Claudia Schmid; Finding the Patterns of Nature: Angie Lewin in studio. Photograph by Alun Callender; The Bird of Passage: Malcolm Green; Why We Should Make Life Simple: Painting by Saar Manche.